WASHINGTON, D.C. – Wednesday, March 28, 2018 – Former FBI Director James Comey will sit down for a Town Hall at 8 p.m. ET on Wednesday, April 25 airing on CNN. The one-hour primetime Town Hall, moderated by CNN anchor Anderson Cooper, will be live from Phi Beta Kappa Memorial Hall at Comey’s alma mater, William & Mary in Williamsburg, Virginia and will be co-hosted by the Student Assembly at William & Mary. 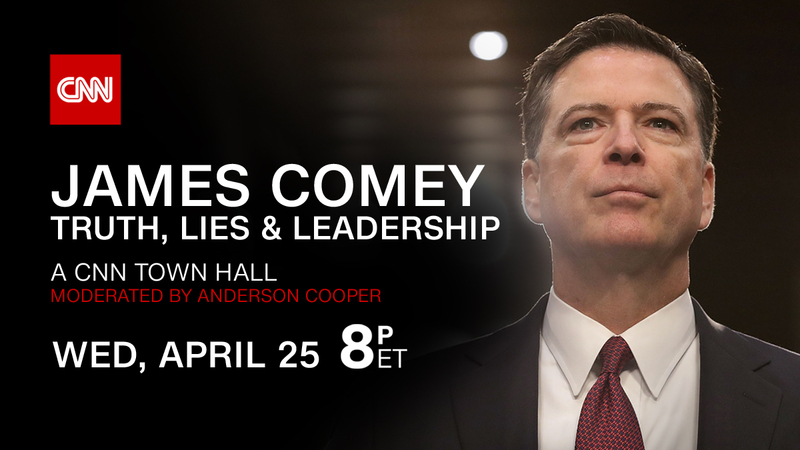 Following the release of Comey’s book, A Higher Loyalty: Truth, Lies & Leadership, Cooper will moderate a conversation between Comey and a live audience as they discuss his FBI career, his public firing and the high profile cases he oversaw including the bureau’s handling of the Hillary Clinton e-mail investigation and potential ties between the Trump campaign and Russia. This follows Comey’s interview with CNN’s Jake Tapper at 4 p.m. ET on Thursday, April 19. The Town Hall will be broadcast in the United States on CNN US, around the world on CNN International, CNN en Español as well as CNN SiriusXM Channels 116, 454 and the Westwood One Radio Network. The program will also be made available to the American Forces Network, seen on U.S. military installations around the world. In addition to live television viewing, the Town Hall can also be viewed via CNNgo at CNN.com/go and via CNNgo apps for Apple TV, Roku, Amazon Fire, Samsung Smart TV and Android TV along with all CNN mobile apps for iOS and Android.